We ensure the sustainability of our entire renewable fuel production chain with certifications. Certifications that we use include the EU-compliant ISCC (International Sustainability and Carbon Certification), RSPO (Roundtable on Sustainable Palm Oil), and HVO Scheme. In the United States, the sustainability of our renewable fuels is monitored through the Environmental Protection Agency's (EPA) sustainability requirements. All of our refineries producing renewable products have ISCC and RSPO certificates, and they have been approved by the U.S. Environmental Protection Agency (EPA). This proves that our production and raw material sourcing comply with the European Union's Renewable Energy Directive (EU RED) and the requirements of EPA, and meet the environmental obligations in the EU Member States and the United States. ISCC is a raw material-independent system. RSPO is particularly designed for certifying palm oil. HVO Scheme, in turn, is used for certifying fuels based on waste and residue type of raw materials. HVO Verification Scheme was approved by the European Commission (EC) in 2014. 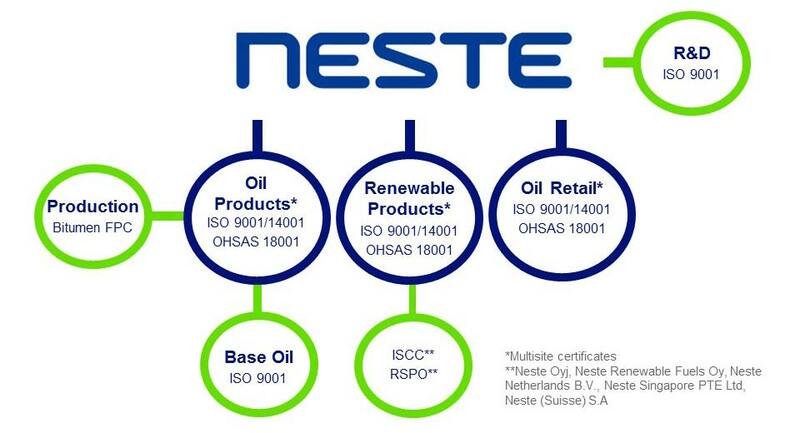 The system development has been led by Neste. It is currently used to verify EU RED compliance of biofuels based on waste and residue raw materials. We only accept certified, fully traceable palm oil. However, not all raw materials used in the production of renewable fuels are required to be certified for the renewable end product to become certified. If a specific certification is not required for the raw material, the regulative compliance regarding sustainability of the raw material production is verified in accordance with Neste's own policies and principles for sustainability and the legislation of the country to which the fuel will be supplied. The certification systems specify what constitutes sustainable operations, what their criteria are, and how the functioning of the supply chain should be documented. workers' rights have been respected. Our operations are guided by business area-specific certified management systems, which correspond to the requirements of the environmental, health and safety, and quality standards issued by ISO and OHSAS. All of our refineries and the company-managed security stockpiles have been certified in accordance with the requirements of the ISO 9001, ISO 14001 and OHSAS 18001 standards. Internal and external audits, conducted by an independent operator, are used to assess the effectiveness of the systems.